Why Is Easter a Magnet for Islamist Violence? Originally published under the title "Why Easter Brings Out the Worst in Islam." Two Coptic Christian churches in Egypt were bombed during Palm Sunday mass on April 10, leaving 50 dead and 120 injured. Why are some Christians murdered and many more terrorized in the name of Islam every Easter holiday? This year's most notable attack occurred in Egypt, where two packed Coptic Christian churches were bombed during Palm Sunday mass, leaving 50 dead and 120 injured. While this incident received some coverage in Western media, attacks on churches in Egypt on or around Easter are not uncommon. For instance, two days after the Palm Sunday attacks, on April 12, authorities thwarted another Islamic terror attack targeting a Coptic monastery in Upper Egypt. 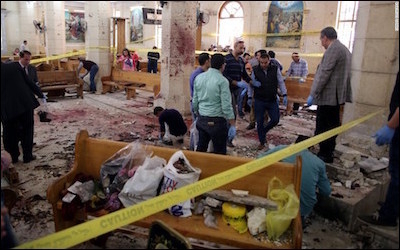 Similarly, on April 12, 2015, Easter Sunday, two explosions targeting two separate churches took place in Egypt. Although no casualties were reported—hence no reporting in Western media—large numbers could easily have resulted, based on precedent (for example, on January 1, 2011, as Egypt's Christians ushered in the New Year—another Christian holiday for Orthodox communities—car bombs went off near the Two Saints Church in Alexandria, resulting in 23 dead worshippers and dozens critically injured). Less spectacular but no less telling, after 45 years of waiting, the Christians of Nag Shenouda, Egypt, finally got a permit to build a church; local Muslims responded by rioting and even burning down the temporary tent the Christians had erected to worship under (different incident from this similar one). Denied, the Christians of Nag Shenouda celebrated Easter in the street, to Muslims jeers and sneers (picture here). More than any other holiday, Easter celebrates Christian doctrines that Islam manifestly rejects. While many things can provoke radical Muslims around the world to attack churches, there is a reason that the animus can reach a fever pitch during Easter. More than any other Christian holiday, Resurrection Sunday commemorates and celebrates three central Christian doctrines that Islam manifestly rejects: that Christ was crucified and died; that he was resurrected; and that by special virtue of the latter, he is the son of God. As Dr. Abdul Rahman al-Bir, Egypt's Muslim Brotherhood's mufti said in 2013, Muslims must not commend Coptic Christians during Easter, for that holiday "contradicts and clashes with Islamic doctrine unlike Christmas." From here the carnage makes sense. Thus on Easter Sunday, 2016, another Islamic suicide bombing took place near the children rides of a public park in Pakistan, where Christians were known to be congregated and celebrating. Some 70 people—mostly women and children—were killed and nearly 400 injured. Something similar was in store for Pakistan this year, 2017, as officials foiled a "major terrorist attack" targeting Christians on Easter Sunday. Celebrating Easter is an especially dangerous affair in Muslim-majority regions of Nigeria: a church was burned down on Resurrection Sunday, 2014, leaving 150 dead; another church was bombed on Resurrection Sunday, 2012, leaving some 50 worshippers dead; Muslim herdsmen launched a series of raids during Easter week, 2013, killing at least 80 Christians—mostly children and the elderly; additionally, over 200 Christian homes were destroyed, eight churches burned, and 4,500 Christians displaced. As Islamization advances in Europe, Easter-related attacks are growing in frequency. According to one report, "the terror cell that struck in Brussels [in March, 2016, killing 34] was planning to massacre worshippers at Easter church services across Europe, including Britain." In Scotland, 2016, a Muslim man stabbed another Muslim man to death for wishing Christians a Good Friday and Happy Easter. If an al-Qaeda terror plot targeting Easter shoppers in the UK was not thwarted "it would almost certainly have been Britain's worst terrorist attack, with the potential to cause more deaths than the suicide attacks of July 7, 2005, when 52 people were murdered." 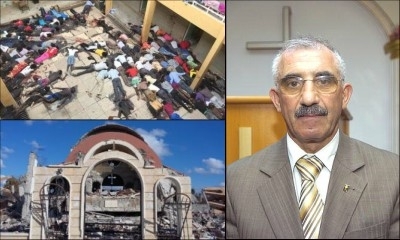 Clockwise from upper left: Christian students massacred on the eve of Good Friday in Kenya, 2012; Pastor Semir Serkek, brutally attacked in Istanbul on Easter, 2012; The Virgin Mary Church in Tel Nasri, Syria, after its destruction on Easter, 2015. The day before Good Friday, 2015, Muslim jihadis raided a Kenyan university and massacred 147; along with the fact that they tried to distinguish between Muslim and Christian students in order to kill only the latter, that they taunted those whom they slaughtered by mockingly saying things like "This will be a good Easter holiday for us" placed their animus in the context of the Christian holiday. In Iran, Easter Sunday, 2012, saw 12 Christians stand trial as "apostates"; authorities raided an Easter service in a house-church in 2014, arresting and hauling off all those in attendance; and in 2015, various churches were banned from celebrating Easter Sunday altogether. On Easter Sunday, 2015, the Islamic State destroyed the Virgin Mary Church in Tel Nasri, an ancient Christian region in northeast Syria. After Islamic rebels fired rockets at a Christian neighborhood right before that same Easter, 2015, killing approximately 40, a woman lamented how "Our Easter feast has turned to grief." In 2015, Muslims attacked a Catholic village in Bangladesh as it celebrated Easter; they stabbed its priest, destroyed Bibles, crosses, holy pictures, musical instruments and homes — and slaughtered goats and chickens. In Turkey, a pastor was beaten by Muslims immediately following Easter service and threatened with death unless he converted to Islam. According to an AP report from 2013, "Iraq's Catholic Christians flocked to churches to celebrate Easter Sunday, praying, singing and rejoicing in the resurrection of Christ," but only "behind high blast walls and tight security cordons." In short, whatever the holiday, growing numbers of Muslims appear to agree with the view voiced by one Egyptian cleric that "Christian worship is worse than murder and bloodshed"—meaning, shedding the blood of Christians and murdering them is preferable to allowing them to flaunt their opposition to Muhammad's teachings, as they most certainly do every Sunday in church. Only more doctrinally attuned Muslims, who are in the minority, save their attacks for that one day of the year that so flagrantly defies Islam: Resurrection Sunday.